Essential geek gear to make an ideal anti-fashion statement. 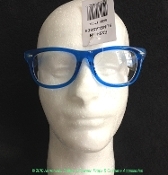 Blue plastic frames with clear lenses are sturdy, lightweight and nerdy. Warning: Wearer may experience a temporary increase in IQ. Pocket protector not included.